Business methods patents, computer-implemented inventions, are a very contentious patent issue. Some view them as just a bunch of software that should be copyright protected and unworthy of the exclusive use protection a patent provides. Others view them as the raw materials for 21st century digital inventions. Mark Cuban, internet entrepreneur, technologist, investor, and basketball expert became so frustrated with the state of patents in the US that he funded the The Mark Cuban Chair to Eliminate Stupid Patents at the Electronic Frontier Foundation. "The current state of patents and patent litigation in this country is shameful... Silly patent lawsuits force prices to go up while competition and innovation suffer. That's bad for consumers and bad for business. It's time to fix our broken system. Much of the discussion of the impact of business methods and questionable software patents happens in the hallowed halls of the USPTO, the offices of leading patent law firms and IP advisories, and law schools doing research using proprietary data from firms that have vested interest in the outcome. Our goal is much simpler. We think that people need to know more about computer-implemented business method patents so that the discourse onthe subject matter impacts a larger audience. Most people who aren't patent cognoscenti don't understand the potential financial impact of some of these patents. So we wanted to highlight business method patents that don't require a PhD in computer science to understand in the hope that the issue will be more understandable to investors, entrepreneurs. So in honor of Mr Cuban&##9;s efforts to free the economy of stupid patents we bring you occasional contribution to the discourse. 1. A system comprising: at least one computer processor configured with software that when executed by the computer processor is configured to: receive transaction data from customer-oriented terminals, the transaction data including requests for monetary transfers on behalf of customers having, and the monetary transfers from, a checking or savings accounts held at a financial institution; access, in response to receiving the transaction data, customer account information that includes an amount of funds in the checking or savings accounts; determine whether sufficient funds exist in the accounts to cover the monetary transfers; and in response to a potential overdraft of one or more customer accounts, access stored customer information; determine, based upon the stored customer information, eligibility of the customer for deferment of overdraft fees; and authorize the transaction based upon the determination of eligibility; in response to an overdraft occurring; defer a fee for the overdraft; provide a grace period during which funds can be transferred to cover the overdraft without charging a penalty and without charging interest; and charge the fee for the overdraft to a credit card account of the customer after the grace period expires. The patent is a divisional sibling of US patent application Ser. No. 12/901,138 now 8,255,330 filed in October 8, 2010. Both are both relatively new. The provisional patent application was filed in October 2009. As a point of reference, the iPhone came out June 29, 2007, three years before this patent application was filed. We asked a person ordinarily skilled in the art (the POSITA) to take a look at the patents. There was no deep dive into the prior art just reading what the patent says. The POSITA is a systems integrator and solutions engineer who has lots of experience building financial systems, integrating applications, building databases and delivering user focused systems. The POSITA has also had to make business decisions on which patents to license and which to build around. So the POSITA isn't a patent expert but knows a lot about computer-implemented business techniques and software patents. The POSITA says what is described here is a banking promotional program dealing with overdrafts implemented using a computer system configured to compare a customer's bank balance against the funds in their account when a check (or other transaction) is presented for payment. If there are sufficient funds to cover the check the bank clears the transition. If not, it's an overdraft. (So far nothing new here.) If the customer is enrolled in the overdraft program, the bank will defer the overdraft penalty as long as they cover the shortage within a specified period of time — the grace period. If not, instead of bouncing the check for a grace period. The bank will charge the a credit card assigned to the account when the grace period expires. To get this benefit, the customer needs to be enrolled in the program. The bank keeps track of who is enrolled and uses that database to figure out what to do when a customer is in an "insufficient funds" situation. Computer programs to keep track of a customer's account and the process of enrolling in overdraft program services provided by a bank. As you read through theh specification it describes computer-implemented method to automate the prior art call/email/text from the local bank after your banker got an alert on their computer that your account is about to be overdrawn because of a check you wrote or your college kid wrote for $250 worth of textbooks (beer & pizza). The patent describes having a a sponsor — Mommy and Daddy for the kid at college or an employer, who has control over how the overdraft penalties are resolved and the transfer of the funds and penalty payment decisions. the option to enroll in the overdraft program is provided over an online network. (You can sign up online or at one of the customer oriented terminals. the option to enroll in the overdraft program includes generating a customer ID for the customer. A customer ID versus an account number? 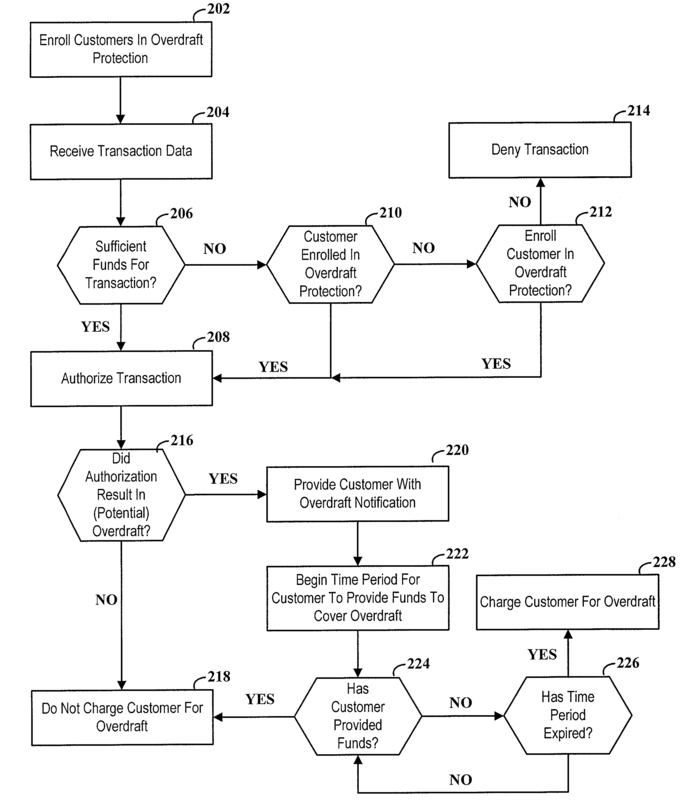 POSITA adds, it is not clear what the novel invention is here but refer to Bank of America's Overdraft Services for a program like the one described in the patent only without the customer oriented terminals spelled out.. But there is an interesting twist here. First the patent talks about receiving transaction data from customer-oriented terminals. …customer-oriented terminals can include bank terminals and/or non-bank/retailer terminals. Examples of bank terminals are ATMs of the bank, teller counters located at various branches of the bank, ATMs of other banks, and any other type of interface at which the customers engage in transactions with a bank. Examples of non-bank/retailer terminals are point of sale terminals at which the customers make purchases using checks, debit cards, credit cards, etc. that are tied to accounts held by the customers at the bank. There are customer terminals at the bank, customer terminals at points of sale — stores, kiosks, gas stations. The question is whether the phrase "any other type of interface at which the customers engage in transactions with a bank" can be stretched to cover Square™ or the mobile banking applications on your smartphone. If this patent can be stretched to cover smartphone apps and technology like Square, and the patent stands, this will be a patent monetization spectacular. The real question is what is novel and non-obvious here. The week of April 30, 2013, 75 business methods patents were granted. Year to date (YTD) USPTO has granted 1,899 business methods patents. Broad domain business methods patents, those categorized according to USPTO's more broad definition of inventions that have business method characteristics totaled 333. Year to date broad domain business methods patents total 7,234.